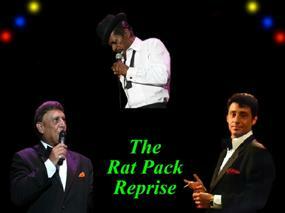 “It’s just ROCKIN!” The Rat Pack Reprise is the Best! All the good stuff that brings us back to seeing “The world today in a brand new Chevrolet,” comes to life, just as we were back then. Frank, Dean, Sammy and the band make your heart soar. The hell with the tough times we may be going through, The Rat Pack Reprise makes us believe that life is good, America is great and we will reach new heights with every note. Don’t miss em’. They make you beg for more! J.P. “Gus” Godsey….Selected The Happiest Man in America, by USA Weekend magazine. “ONE SWINGIN’ NIGHT” is, perhaps, one of the few special productions that shall become as timeless as it’s actual counterparts: Frank, Sammy & Dean. The Rat Pack Reprise has delighted audiences throughout the United States and Internationally, in venues such as New York’s Westchester Broadway Theater, The Stage West Theater in Toronto, Canada, The Alladin Theater in Aruba and countless casinos, corporate and festival appearances. In “ONE SWINGIN’ NIGHT” they recreate the spirit of these legendary swingers and transport their audiences to a time when life was a lot less complicated and a lot more fun. With remarkable accuracy, The Rat Rack Reprise celebrates the friendships, talents, singing styles and fun filled attitudes of Frank, Sammy & Dean. Thus causing critics to proclaim “One Swingin’ Night” as being as close as any person could come to experiencing the original Rat Pack, and a show that Must be seen!